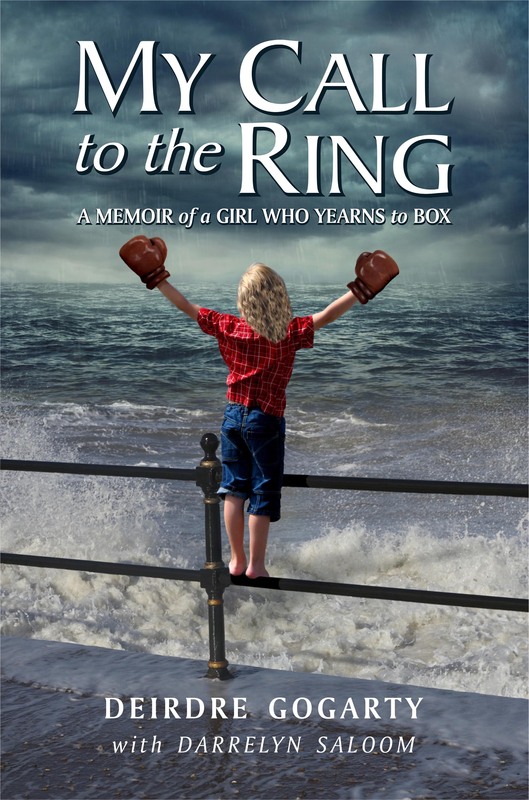 After nearly six years of collaboration with Deirdre Gogarty and hundreds of edits and revisions with Dave Malone, I am pleased to announce My Call to the Ring: A Memoir of A Girl Who Yearns to Box is now available from Glasnevin Publishing. You can order online from Amazon US, Amazon UK, Barnes & Noble, Waterstones, and WHSmith in Britain. Deirdre Gogarty and I were thrilled to receive the blurbs below. And there are more on the way. I am forever grateful to the people (and critters) in my daily life and on Facebook and Twitter who have kept me going with their support and encouragement. The list is long. But you know who you are, and I love you dearly. Hope you enjoy the true story of Deirdre Gogarty as she defies convention to answer her call to the ring. This entry was posted in Stories from the Farm. Bookmark the permalink. Knockout story, knockout writing, knockout cover, knockout blurbs. Ain’t nobody gonna be standing. We’ll be reading on our backs. 🙂 Many many congrats for staying the course on this memoir. Words can’t describe how thrilled I’ve been to be a part of this process with you and Dee. Thanks for sticking with me, Malone. Don’t know what I would do without you. Same here, my friend. Same here. Congratulations! Ordered my copy! Looking forward to reading it. Thank you, Carolyn. Your lifelong friendship means the world to me. Derrelyn, you’ve been such a warm FB and Twitter friend that I can’t wait to order and read this book. In fact, I’m off to do so right now. I know I will learn a lot from your six years of blood, sweat, and tears. That image seems to fit a boxing memoir! And I know my own tears will be ones of joy for you and Deirdre. Great blurbs! Sorry about misspelling your name, Darrelyn! Amen, Cynthia. How about that cover? Thank you, Connie. Hope you enjoy! It’s been a long time waiting for all of us who know & love your writing. I’m savoring every word. I borrowed an iPad to begin reading. Now I will be stalking my mailbox until my paperback copy arrives. Congratulations D & D! May be a while, Jenny. London Olympics slowed down the printing. But it’s a comin’. Dear Darrelyn: Do you remember when we stood in front of the closed bookstore in Cincinnati and visualized on the shelves? I believe with all my heart that we create our own reality, and you are living proof I am right. I am so proud of you and thrilled for you! It was a magical night, Barbara. Hope I never forget. Darrelyn, I am ordering my paperback copy. I can’t wait to get to know you better through your writing. Congrats on seeing your hard work finally coming to fruition; you are an inspiration for me to work towards my dreams as well. I am so glad you reached out to me on Facebook, thanks for the friendship and love you so freely give out to others. Thats what truly inpires me! Thank you, Kent. I am thrilled you stopped by and left a comment. Hope you enjoy the book. Congratulations Darrelyn. I love the blurbs from the fighters like Larry Holmes and Chuck Wepner. Certainly adds credibility to the story. Pingback: Bestsellers » Lit A Memoir P.S. I’m heading to my comfy bed right now to read it!! Congratulations, Darrelyn….I knew you could do it. You are such an inspiration!